The complexities of the English language can be daunting for even the most fluent speakers, and for Canadians this is doubly so with the mixture of British and American traditions. Almost anyone engaged in formal writing will sometimes need to consult a usage guide for advice, but Canadians have always been forced to choose between a British or an American source. With the Guide to Canadian English Usage, writers will have an authoritative reference based on Canadian sources that provides pithy direction on numerous details of the language. From the indefinite article to zoology, alphabetically arranged entries clarify issues of word choice, punctuation, spelling, and abbreviation. Throughout it offers guidance on Canadianisms, confusibles, difficult expressions, First Nation names, foreign phrases, grammar, inclusive language, punctuation, spelling, and troublesome pronunciations. Each entry explains the problem at hand, outlines a range of prescriptions, and then either recommends a particular usage or reviews the alternatives from which the now-informed reader can choose. All entries feature a wide range of fascinating quotations from Canadian sources. 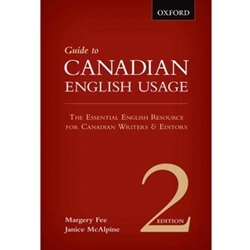 Newly reissued in an attractive hardcover edition, the Guide to Canadian English Usage is the essential reference for any writer, editor, or speaker of English in Canada.